The issue of sustainability covers all aspects of our lives. At Green Futures we obviously are mainly dealing with food and food production but we are keenly aware of many of the other things we need to think about. For instance we recycle as much of our waste as possible. We use ethical suppliers where we can and make use of recycled products. When we buy in cleaning materials we buy in things that bio degrade and don’t leave an impact on the environment. Becoming more sustainable is something humans will be forced to deal with sooner or later and as ordinary people and decision makers start to realise this we will see more and more everyday changes to the way things are done and run. The homes are the result of an engineering research project led by the University of Bath. The researchers worked with specialist architectural firm Modcell. 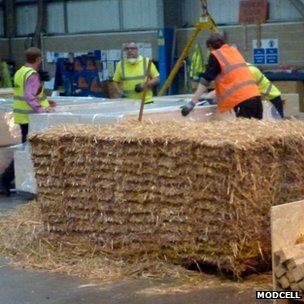 The team says this development should move building with straw from a niche technique for the ecologically minded to the wider market. The houses, on a street of traditional brick-built homes in Bristol, are clad in brick to fit in with the surroundings. But their prefabricated walls are timber framed, filled with straw bales and encased in wooden boards. As part of this EU-funded project, Prof Walker and his colleagues have systematically tested and refined the technology – including testing its structural and weight-bearing properties, and its thermal insulation. He added that, since straw absorbs carbon dioxide as is grows, using it as a building material actually “locks carbon into the walls” of a building. For more info follow this link to the BBC News Story.